I don’t sew very often because, let’s face it, my forte is not in sewing. Sewing in a straight line is my current sewing related goal. It may seem like small potatoes to some of you, but it’s a goal for me. As much as I’d love to claim that I meant to do that when my seams aren’t straight and the lines are crooked, nobody means to sew that poorly ever. Which is where I come in – sewing badly all the time. But I can sew, on occasion and intentionally. After sewing a dress that was sized for Neos, I eyed the fabric I had left over and decided that I really wanted to make a dress for Middie as well. 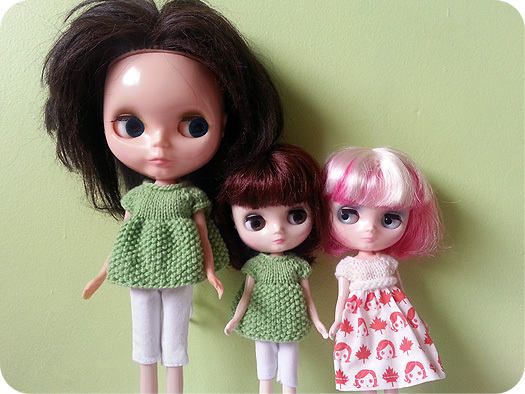 While I hemmed and hawed over the design, I remembered being charmed by the big-little outfits I made previously, so I just had to do it again. 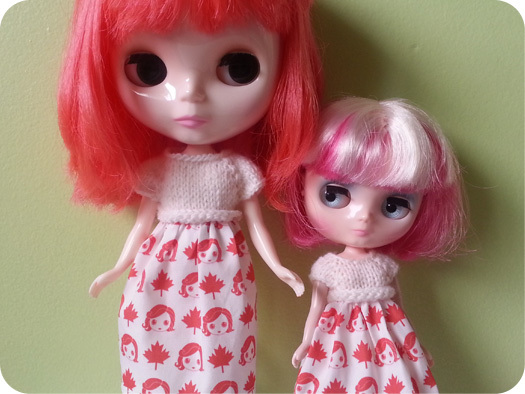 Nothing says I love Middies like dressing them like the (bigger) Blythes! Making twin outfits is definitely my wheelhouse. What do you think? 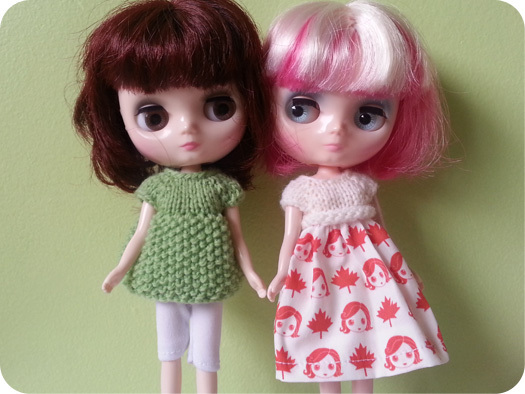 I’m definitely thinking of making more dresses like the BlytheCon Vancouver ones. It helps me combine something I love and am fairly decent at (knitting) with something I’m not-so-good at (sewing) and they actually fit and look okay! Kitty Brighton’s wearing: top/chelleshocks (me! ), capris/unknown. I’m looking for a Middie currently and I want her to at least somewhat resemble one of my Neos so they can be sisters! So cute to dress them the same! These outfits are so cute! I love how the neos and middies match!